A short distance up the road from where we live on Whidbey Island in Washington’s Puget Sound is a beautiful cemetery. Some of the graves date back to the late 1800s, old for this part of the country, while others are brand new. 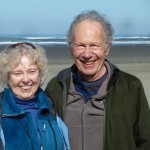 There are open spaces for green burials and a special garden for ashes. Altogether it’s a wonderful place to visit, and many people go walking there every day. Behind the cemetery is a patch of woods. These woods are privately owned, but the owners are generous and public walking paths have been in place for a long time. Every so often someone goes through and clears them, lest they disappear under the vigorously growing understory. If a tree falls across one of the trails, an angel will soon come with a chain saw and cut out the portion blocking the trail so the walkers can enjoy the woods unimpeded. These woods are unexceptional. They are third growth forest or perhaps younger, with most of the trees probably no more than 40 to 60 years of age. I have not seen any old-growth giants there at all. 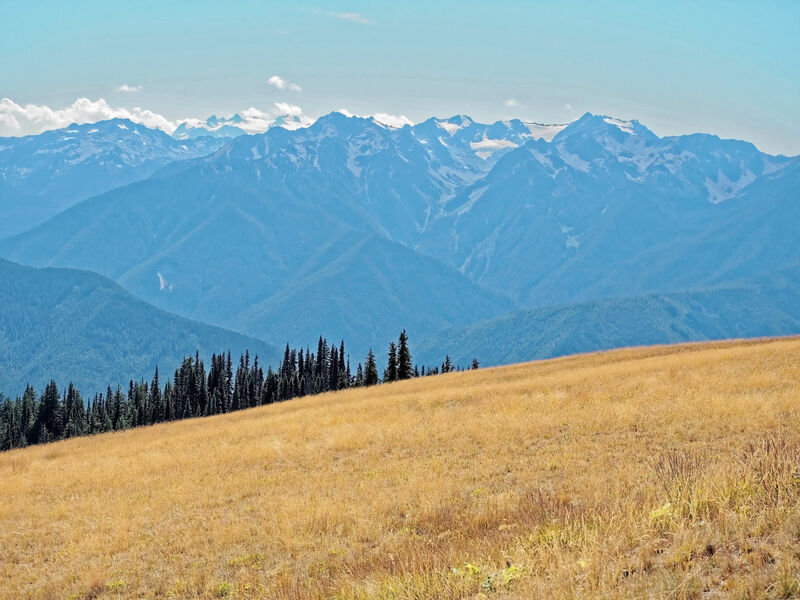 The forest is healthy in that the alders, Douglas firs, and hemlocks are widely spaced and the absence of dense shade permits a vigorous undergrowth. 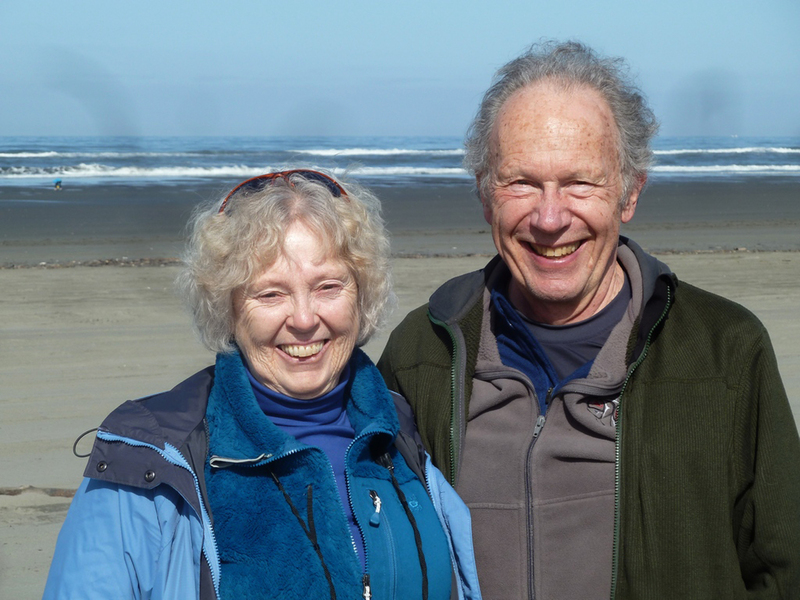 If you stroll there, you will find salal, salmonberries, trailing blackberries, sword ferns, lady ferns, evergreen huckleberries, huge drifts of foam flowers, nettles—all the usual denizens of recovering forest in the coastal Pacific Northwest. In a few spots you will also find clumps of Indian pipe, Monotropa uniflora (family Ericaceae, the heath or blueberry family). 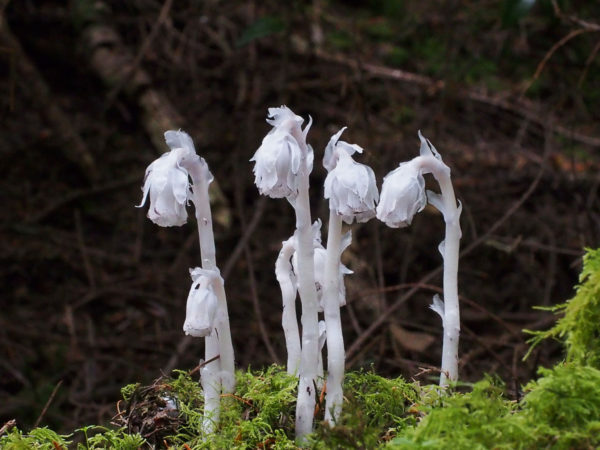 Indian pipe is a ghostly, fleshy, white-stemmed wraith with a nodding white flower at the tip, poking its way up through the duff of the forest floor. It looks like nothing else in the forest and like nothing in your garden. Looking up into the throat of the flower reveals its inner beauty. 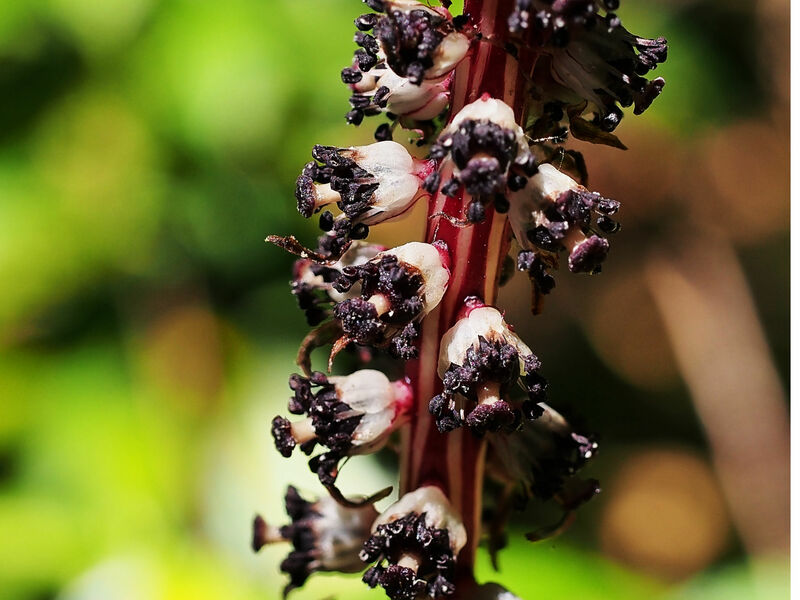 As you can see in the photograph below, all the usual flower parts are there—sepals, petals, stamens and pistil. The conspicuous style is hexagonal and a handful of pollen grains have landed on it. The principal pollinators are bumblebees. Still, even a cursory glance at the Indian pipe tells you that this is an unusual plant. It’s natural to wonder what sort of life it leads among the green commoners all around it. What can we deduce from direct observation? 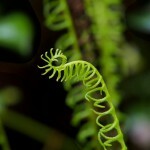 There is no green to be found anywhere on the plant—not on the stem, not around the base, nowhere. No green means no photosynthesis. No photosynthesis means no sugar production, and hence no production of the food that would provide energy for growth and reproduction. If the plant doesn’t make its own food, it must get food from some other source. 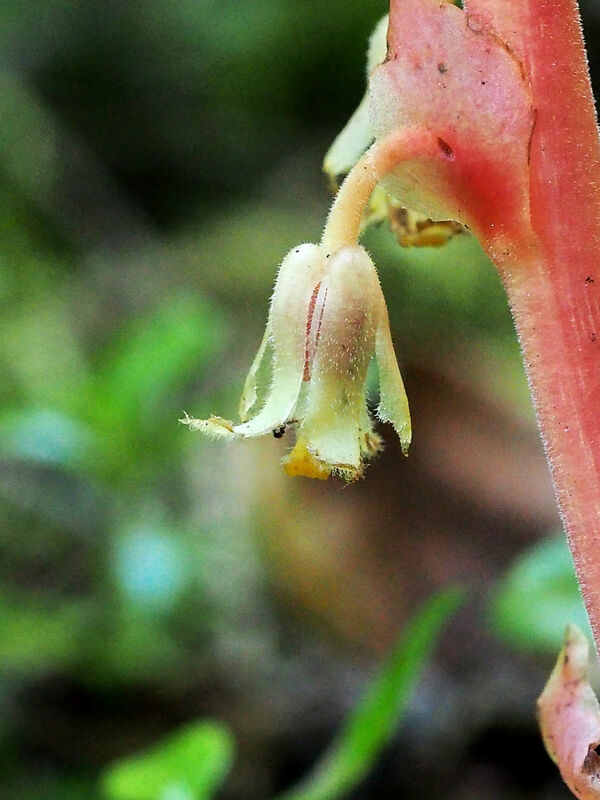 Unless it gets its nourishment by trapping insects, as do the famous pitcher plants and sundews, the Indian pipe must obtain its sustenance from other plants, ones that do photosynthesize. The life-support system of the Indian pipe turns out to be linked to a mutualistic or symbiotic web of life that is virtually universal in soils, whether in the forest, the field, or your front garden. Energy flow in the system is anchored by a process we have seen repeatedly: green land plants use the energy of sunlight to form sugar molecules out of the carbon dioxide of the air and water drawn up from the roots. It takes more than just sugar, however, to carry out life processes and synthesize the vast array of molecules out of which living cells are made. As any gardener knows, the soil must also contain nutrients, especially the mineral nutrients nitrogen, phosphorus, and potassium. This is why most commercial fertilizers carry labels specifying the ratio of these elements—N, P, and K—that they contain. Such nutrients enter the plant through the roots. And they enter more efficiently if the entry process is assisted by a fungus. Structural complexes composed of the fine underground fungal threads called hyphae and the finest roots of a plant are called mycorrhizas (or mycorrhizae), meaning “fungus roots” (myco- for fungus and –rhiza for root). In recent years it has become increasingly evident that the roots of the vast majority of land plants are associated with mycorrhizal fungi, and that plants grow better when such associations have been established than they do in their absence. The best demonstrated contribution of mycorrhizal fungi to the life of green plants is increased uptake of mineral nutrients by the plants. Better nutrient supply leads to better growth. But here is a conundrum. Fungi themselves are not photosynthetic, and they have to acquire the chemical energy needed for their own life from other sources. Some fungi are decomposers, and they obtain the energy they need for life by digesting wood and other materials that were previously synthesized by photosynthetic plants. 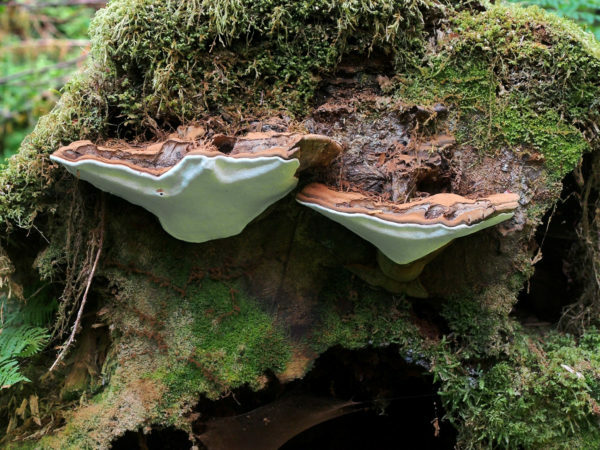 A common example is the shelf or bracket fungi that you are likely to find on tree trunks on any walk through the woods, for example this artist’s conk (Ganoderma applanatum). 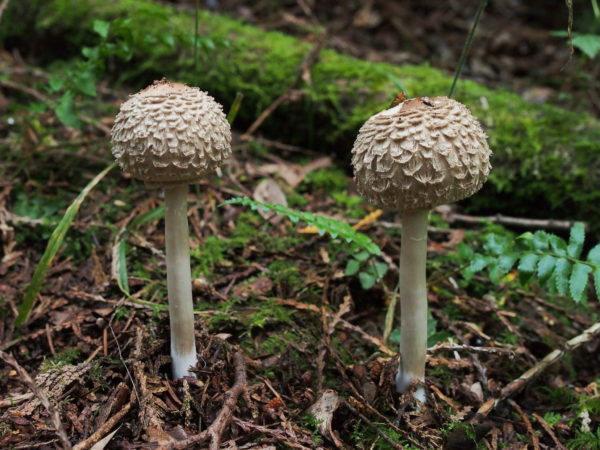 Many other fungi, however—including most of the mushrooms of the forest floor, like the shaggy parasol (Chlorophyllum rhacodes) pictured below—obtain their sugars, and hence energy, not primarily by decomposition but from the roots of living green plants. They are the fungal partners in the mycorrhizas that help the plants grow in the first place. We can think of this as a partnership. Mycorrhizal fungi obtain sugars from green plants, and they supply green plants with minerals. Each gains from the association. So what about the Indian pipe? We have deduced that it must get the sugars it needs from plants that photosynthesize. The Indian pipe obtains these sugars, however, not directly from the roots of the photosynthetic trees growing nearby but indirectly from mycorrhizal fungi that carry out their typical mutualistic exchange with those trees. Thus, Indian pipe is the third member of a triad of nutritionally-related organisms. Sugars are made in trees, pass into mycorrhizal fungi, and then pass again from the fungi into the Indian pipe. Mycorrhizal fungi give minerals to green plants in exchange for sugar. Does the Indian pipe give anything to its fungi? At present, there is no evidence that it does. The relationship of plants like Indian pipe to their food-supplying fungi appears to be not reciprocal, mutualistic, but rather one-way, parasitic. 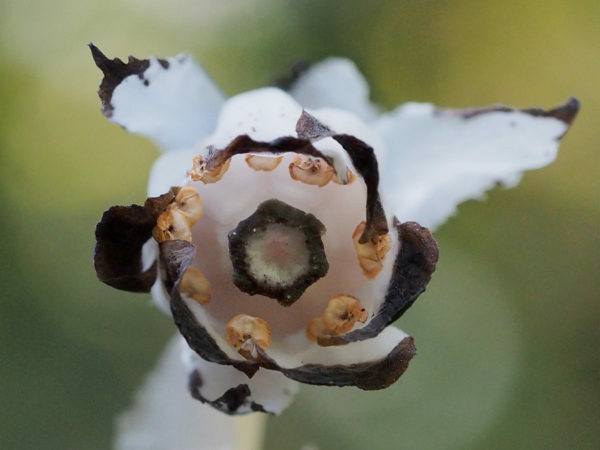 The Indian pipe is but one member of a diverse group of plants that rely on mycorrhizal fungi for their food supply. These plants are collectively called mycoheterotrophs, a term that refers to the fungi (myco-), and to feeding on other organisms (heterotroph). Organisms that make their own food are called autotrophs, self-feeders. All mycoheterotrophs, by definition, depend on their mycorrhizal fungi. The minuscule seeds of all orchids, for example, require mycorrhizal association for their germination and early growth, and many orchid species remain in this category as adults. 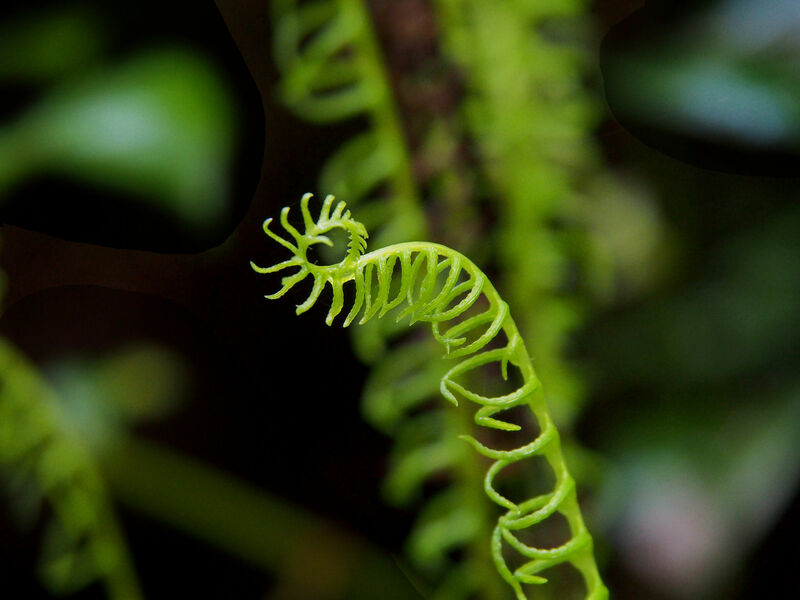 Over 400 species of plants are thought to obtain all of the sugars that are essential for their life from mycorrhizal fungi; most of these species occur in the tropics. Among the temperate region plants that depend on mycorrhizal fungi are pinedrops (Pterospora andromedea) and sugarstick (Allotropa virgata). Both of these plants are related to Indian pipe. All three species have a wide distribution in temperate forests, but they are not abundant. Close to home I have found Indian pipe not only on Whidbey Island but also in the rainforest of the Olympic Peninsula, and pinedrops and sugarstick in the Olympics and the North Cascades. If you, too, find these wonderful plants in the woods, please be careful not to damage them. It’s easy to do, because they tend to be very brittle. And don’t try to transplant them. They will die, because you will inevitably leave their necessary mycorrhizal fungi and photosynthetic partners behind! In a later post we shall return to the wonderful world of mycorrhizas, and the ways in which their hard-to-see strands of humble fungi, only one cell thick, bind together the conspicuous denizens of the forest. In the meantime, look with a sharp eye for the spectacular plants, the mycoheterotrophs, which lack chlorophyll and flourish only because the unseen hyphae of their mycorrhizal fungi link them to the familiar, primarily evergreen, trees all around. Yes, I have found the whole idea of mycoheterotrophy fascinating, and the plants are beautiful! Can’t wait to go out and look for some with new eyes now! Thanks! One of these days I will put together a post on classification, and I plan to use the heath family as one example. What a wonderful, inspired explanation of the interconnectedness of life! The choices of examples and the pictures added a dynamic to the post that was very compelling. Thank you. Thanks for your kind words, Marc! These are excellent questions with complex answers. Indian pipe is very widely distributed across North America, so both the mushrooms and the trees with which it is associated vary. 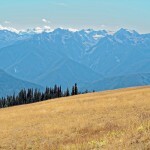 In the Pacific Northwest, Douglas fir is a common partner, but even there I bet it’s not exclusive. At least two genera of mushrooms have been identified as mycorrhizal intermediaries, Russula and Lactarius. Check out these two links to get a start on exploration: https://botit.botany.wisc.edu/toms_fungi/oct2002.html and https://www.wildflower.org/plants/result.php?id_plant=moun3. You might consult a local book on wild plants to see when the blooming season is. My experience, though, has been that while Indian pipe has a very wide geographical distribution, in any given area it is rather scarce so you have to get a tip, look hard, or get lucky! 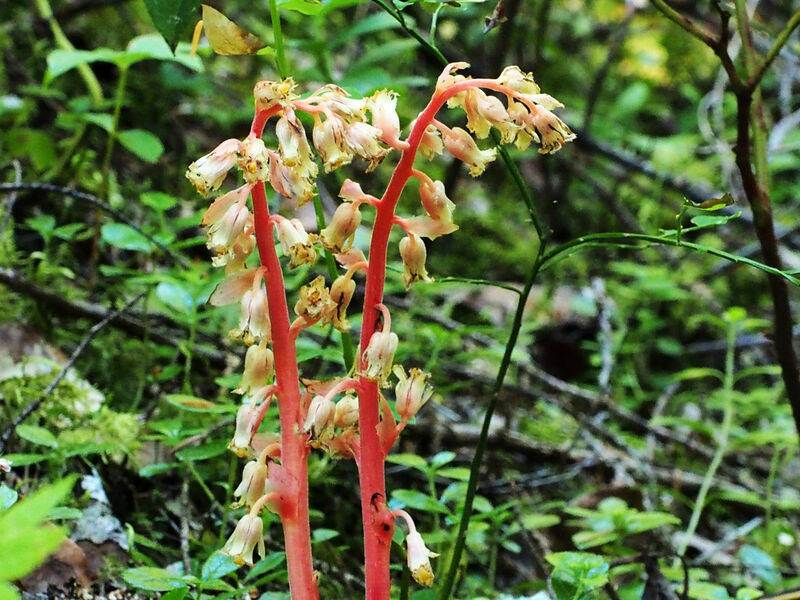 Here is a link to the University of Virginia that might be helpful: https://mlbs.virginia.edu/organism/monotropa_uniflora.